WELCOME TO THE STREET CONNECTIONS WEBSITE! The new Good Samaritan Drug Overdose Act protects people who experience or witness an overdose and who call 911 for help. The Act applies to anyone seeking emergency help during an overdose, including the person overdosing. The Act protects those who either stay or leave from the scene before help arrives. The Act does not protect you if you have outstanding warrants or are producing or trafficking drugs. The changes do not protect you from other crimes not outlined within the Act (e.g., possession of stolen property). 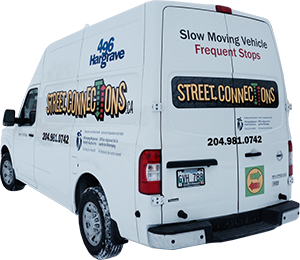 Street Connections is a mobile public health service. Our goal is to reduce the spread of sexually-transmitted and blood-borne infections (STBBIs), including hepatitis C and HIV, and reduce other drug-related harms. We are part of Healthy Sexuality and Harm Reduction in the Winnipeg Regional Health Authority's (WRHA) Population and Public Health Program. Public health nurses and outreach workers staff our van, which drives around the city every evening except Sunday. You can also find us during the day from Monday to Friday in our office on the main floor of 496 Hargrave St.
We base our services on a harm reduction philosophy. This means that we support programs and policies that improve the health of people who use drugs and support people in their efforts to keep themselves and the larger community safe, without judging people for their sexual or drug use practices. Stop at Sargent and McGee St.
Stop on Selkirk Ave. near McKenzie St.
Stop on Main Street near Jarvis Ave.
Stop at William Ave and Isabel St. Call 204-981-0742 to find us! How can I start working or volunteering with Street Connections? All hired positions are posted on the WRHA careers website: http://www.winnipeghealthregion.ca/careers/. If you are interested in volunteering, contact WRHA Volunteer Services at 204-787-5078 or 204-787-7247 or email volunteer@wrha.mb.ca.